WeWriWa: Back for Seconds . . . They turn you into a weapon against those who trust you, against those you love, making you an extension of their reach, seeing through your eyes, acting through your hands. That’s not what was happening. He’d fought them, had beaten them, had been rescued before they had a chance to turn him. He hadn’t let them get inside to take control like cruel puppeteers plucking at strings, manipulating his movements. But was that real or what they allowed him to believe? Max massaged his forehead to alleviate the tension building there. Could he begin a new life here amongst these caring friends not knowing if he was an unwitting agent of their destruction? Or did the real illusion reach even farther, making him think the past he was trying to recreate ever existed? Wasn’t the real question why had they made it so easy for him to escape? A second chance is all my hero Max Savoie desires - to find out who and what he really is. His memories stripped by the Chosen, a mysterious, cerebral faction of his own more beastly clan, he discovers he's mated to a New Orleans detective, a female he doesn't recognize, and hailed as leader of a cause he doesn't remember. But who can he trust to show him the way when he just might be his own worst enemy? PARANORMAL ATTRACTIONS is now available for pre-order, with a release date of June 20, 2016 on Kindle Unlimited. Rip into these otherworldly tales . . .
What second chances have you taken . . . or let pass you by only to regret it? WeWriWa: Welcome to the Jungle!! 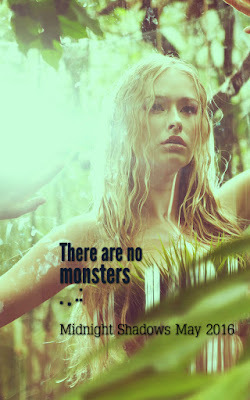 She doesn’t believe in monsters . . .
Myth-busting ethnologist, Sheba Reynard's life's work is proving that destructive paranormal beings don’t exist. But while exposing hoaxes, she's also hiding from the frightening shadows in her past that say differently. To find the missing pieces of her memory that continue to haunt her dreams, she must face the truth behind the nightmares . . . a truth that could lead to madness or even death. He doesn’t believe in death . . .
Frank Cobb knows monsters are very, very real. He's pursued a wily vampire into the jungles of Peru, prepared to face the demon with only his very human skill set. But are his motives—to bring the creature back for government research—purely business or for revenge? Either way, he’s not happy to have an annoyingly strong-willed—and utterly irresistible—woman getting in his way. Forced together by circumstance, they venture into the shadowy unknown. Only it soon becomes clear that one of them will have to surrender their quest . . . if the other one is to make it out alive. 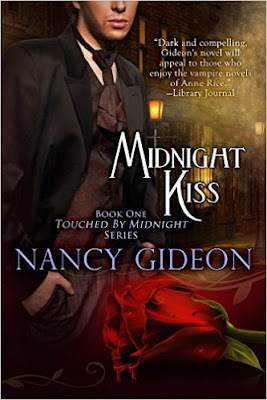 Nancy Gideon is the award-winning author of more than fifty-five novels ranging from historical and contemporary suspense to paranormal, including her Touched by Midnight vampire romance series. She meet his gaze directly, hers expressing her scorn and disbelief, yet there were shadows lurking behind the bravado, shadows he hated like hell to bring out into the open. She tried to laugh it off but the attempt at humor lodged in her throat, a hard, choking lump of horrible truth. She knew Cobb wasn't lying to her, but to say she believed him was to let her own personal demons loose, and she wasn’t ready for that yet. Writing is on a temporary hiatus as I scramble to get things ready for the June 20, 2016 release of the first boxed set I’ve ever participated in along with eight other uber talented authors (What a learning curve!). My addition to PARANORMAL ATTRACTIONS is REMEMBERED BY MOONLIGHT from my By Moonlight series. PARANORMAL ATTRACTIONS is now available for pre-order through Amazon. Check out this lush cover! More to come on this next week . . .
Now, out to dig in the dirt and get some Vitamin D therapy (Finally! Last Sunday there was snow!!). That feeling when you write the final sentence of your first draft. Yeah, it’s like that. Euphoria! Now, you can finally get to some of the other things stacked up on your desk and collecting dust bunnies all around you. Things like planting flowers, getting out summer clothes and trimming cat toenails. But . . . you just can’t let it go. Maybe a quick read through . . . And next thing you know, you’re elbow deep in editing. Yeah. It’s like that. Until that moment, Syl didn’t realize how tightly she’d been hanging onto Cale’s assurances that they’d be close by. She sank into the truth that she was truly and terribly alone like deep, dark waters, with no welcoming shore in sight. Here it was. She’d planned this chance for a noble act that would wipe the slate of her sins clean. She could either sink or swim. Turow took no reassurance from his king’s somber claim because it wasn’t about fault, it was about fact. Sylvia was gone and by now, James probably had her. Had her and was going to hurt her. Well, I have to step away from the manuscript to do some final proofing for my part in the 9- author PARANORMAL ATTRACTIONS boxed set that will be available for pre-order May 23! A dirty job . 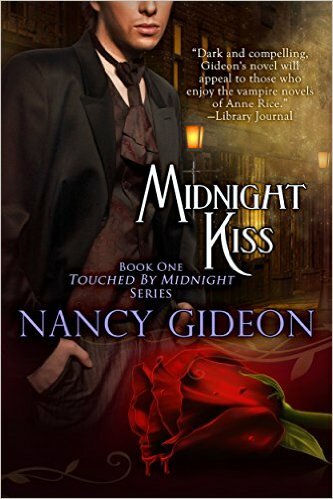 . . And then do a last day push for the sale on my Touch of Midnight vampire series books 1 and 2 (MIDNIGHT KISS just .99 and MIDNIGHT TEMPTATION $1.99!). I’m over on the Bell Bridge Books blog talking about resurrecting a series if you have time to pay a visit. I'll try to stop in to visit everyone but be warned, I'm on the last chapter of PRINCE OF HONOR and once I'm on a roll . . . I should have a snippet from PoH next week, or maybe from the YA paranormal proposals I'm pulling out to polish up. Happy Writing! And Happy Mother's Day to you Moms out there! I’m on the last two chapters of my W-I-P and approaching the best and worst of times: rewrites and line edits. I love to play with words - twisting, turning, beating them into shape. I should have been a massage therapist! Going back through a book to enrich scenes is my favorite part of writing. It’s like being on the playground, free to explore and run and work off energy . . . until the playground monitor comes along to remind you of the rules. Rules? . . . There are no stinkin’ rules in having fun! But there they are - those bullies - forcing order into the free range chaos of imagination. Oxford commas, participles waiting to be undangled. Affect . . . effect. My brain hurts! I need to go back to grammar school . . . Taking a step away from the approaching panic to breathe and shamelessly promote something less stressful – a SALE! I always anticipate good things to come in May (birthday month, after all!) This one starts off with an AWESOME sale on the first two books in my Touched by Midnightvampire romance series! From May 1 to May 15, book 1: MIDNIGHT KISS will be available through all outlets for $0.99 and MIDNIGHT TEMPTATION, book 2, will be $1.99! 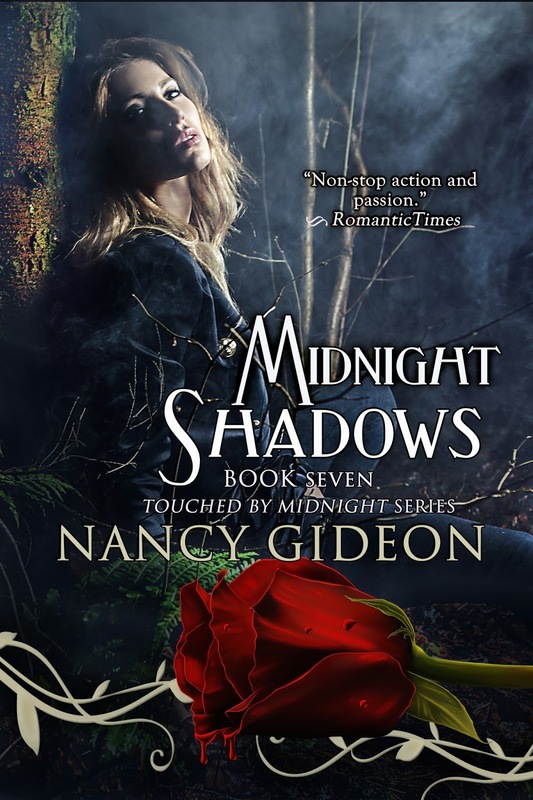 This is better than getting two books for one and a fab opportunity to sink your teeth into the series and chew your way up to MIDNIGHT SHADOWS which will be out at the end of the month. Back to work. This book isn’t going to write . . . or edit itself. 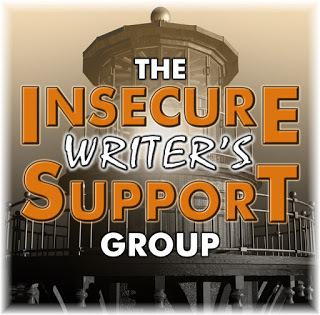 IWSG awesome co-hosts for the May 4th posting will be Stephen Tremp, Fundy Blue, MJ Fifield, Loni Townsend, Bish Denham, Susan Gourley, and Stephanie Faris! WeWriWa: May Day!! May Day!! SHE’D WANTED HIM to kiss her. That knowledge shook him nearly as much as the thought of her in danger, making him pace the porch, desperately wishing for a cigarette. He’d felt the instant her intent had shifted from seeking comfort to steeping desire, in the way her body went from inanimate to molten in a single luxurious movement. He’d been doing the noble thing in taking her into his arms, to console her like a child. Well, that child had grown up damn and disturbingly fast, and he’d found himself with a willing woman in his arms. He’d remained still while his imagination roamed every long and lithe degree of her, filling in what he didn’t know from the feel of how she pressed against him. No fragile girl – probably from toting that hernia-popping suitcase of hers-she was tough and toned and yet still deliciously woman. He’d wanted to seek out soft spots with his hands, to taste sweet places with his mouth. When her breath blew warm and seducing upon his neck, he’d been a shivering mass of lust right down to his cotton socks, and if she’d lifted her head and he’d seen longing in her big brown eyes, it would have been all over for him . . . his nobility would have cracked wide open. Thank God she had more control than he did at that precarious moment. I always anticipate good things to come in May (birthday month, after all!) This one starts off with an AWESOME sale on the first two books in my Touched by Midnight vampire romance series! From May 1 to May 15, book 1: MIDNIGHT KISS will be available through all outlets for $0.99 and MIDNIGHT TEMPTATION, book 2, will be $1.99! 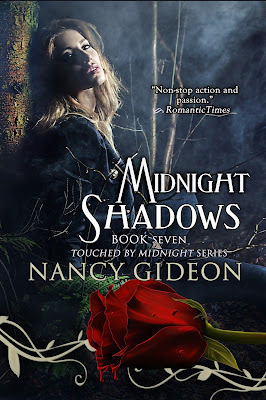 This is better than getting two books for one and a fab opportunity to sink your teeth into the series and chew your way up to MIDNIGHT SHADOWS which will be out at the end of the month. Happy May Day to all. I'm at a weekend writers retreat(!) and hopefully busy finishing up my W-I-P, PRINCE OF HONOR. More on that next weekend . . .